I'm a noob on all levels here, so apologies upfront. I've been developing a piece of art for a music project called "Through the Earth" and I've gone through several redesigns of the same idea. After reading a little about pixel art (the first page of Google results for "pixel art tutorial") I thought I'd give it a shot. I sort of like the sky, land, and trunk, but I can't begin to figure out the leaves. It sort of looks like a barf tree. I'm considering scaling up the resolution to make creating small leave shapes easier and to give me the ability to write the name in better, but I'd lose to low-res feel to the land and trunk. I'm posting it here for two reasons. One, you guys are good at helping with this kind of thing. Two, its the first time I've done pixel art, so I'm wondering how it went. If it's okay, I'm posting the earlier artwork I did for this cover as a reference. Mostly, I'd like to recreate the text that I did for this in a pixel art style, but I haven't gotten past the leaves yet. 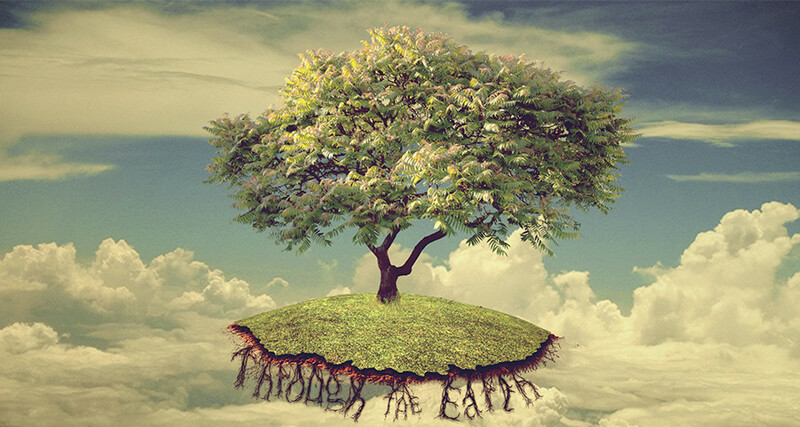 The only things I didn't create in this art are the tree and the sky background, both of which came from CGTextures. As a piece of art, it doesn't look bad at all dude. In fact, I like the painterly style of the leaves and clouds the best. However, if what you're going for is more of a clean, refined, look, then, I suppose you're way off the mark (depending on how clean or refined you want this to be -- like I said, I love the style of the leaves/clouds). One tip I could give you that would help you at least get started with the leaves is to not try to detail them at all. Instead, think of your pixels as "clusters" (a term that has caught on in the pixel art community in recent times). What this means essentially is that you should avoid single pixels in your image wherever possible, instead working them in clusters of, at minimum, I would suggest three or more (as a rule of thumb). Looking at your image, you obviously have a ton of stray (dark) pixels in your leaves and it's taking away from the overall flow of your eye across the image (which really bites because the lighting on the leaves really leads the eye well!). That being said, your other clusters aren't too bad at all. You blob the pixels up in very reasonable places in your leaves. The ground (at least the part on our left) could use more shadow (and removal of the lighter pixels) to indicate it's volume a little better. Finally, I would suggest you keep the resolution you've got here for the text. If you're limited by your canvas size, you could squash down the dirt-to-grass ratio as in your high-res image there. The text from those images would definitely be possible at this scale. You'd just need to be careful with the small "the" since it could be read incorrectly if you don't make the rest of the text large enough to accommodate its small size. You could increase the width of your land mass in order to accommodate larger text. Think of it as a challenge. I won't even go into color count since you're obviously from a traditional painter background of some kind lol, but your color over-usage isn't too bad considering the look I assume you're going for here. But speaking of color usage, I think you could use some very subtle lighter hues in your grass to accent the 3d-ness of it (toward the front middle edge). Personnaly, i love your clouds ! I see different things that should be fixed. First thing, save your art in 1:1 scale in .png or .gif format = easier to edit when the piece is still a wip and you don't mess with your palette (.jpeg compress everything badly). I tried to come back to you 1:1 scale but the .jpeg screwed the palette so i let you fix it. I'm not very good at it but i think your light sources are strange : some leaves should be light and they are not, the rocks under the grass are shining but i don't understand why. Also, the bright pixels in the clouds on the down left are awkward. You should maybe get rid of them. Thanks for the input! I may not be able to post edits soon (I'm doing this at work in my free time) before I apply everything that's been said here. astraldata: I think your right about the look I'm going for. I tried to hold down the color count, but I still wanted to get as many colors from the original piece in as possible. I did decide to omit those pinks and purples in the leaves of the original for the sake of clarity, and I might take out some of the extremely subtle shades of the clouds (I'm using RGB colors (219,207,154) and (214,202,151) and I don't know why.) but I guess color count isn't my biggest concern until I start ruining the "nostalgia"-esque feel. Clusters! Should've thought about that earlier. I think I'll go through and try to stick to the "three pixels or more" rule of thumb, but I might also try to reduce the larger flat clusters. Some of that yellow looks like a yellow blanket covering the top of the tree. Is that a good idea? Coltrane: Sorry about the .jpeg thing. I've got this saved as a .gif and .png on my computer, but imgur decided .jpeg was better. Used first google result to make a gif of the tree and how much I've updated it so far. Quality is crap on this .gif, but it's definitely getting MUCH better VERY quickly. Thanks for the advice guys! It's helping a ton! I'd love to do an edit of your piece, but It's so large and riddled with artifacts that It's nearly impossible. If you could post it in 1x without those it would help us immensely in helping you! I enjoy what you have so far, and I think with some cluster control you'd have a pretty wonderful piece. Try using graphics gale. It's made for pixel art, it's easy to use, fully customizable, and it's free (unless you wanna save as .gif and, in that case, you just export/import a combined image to keep your frames of animation). 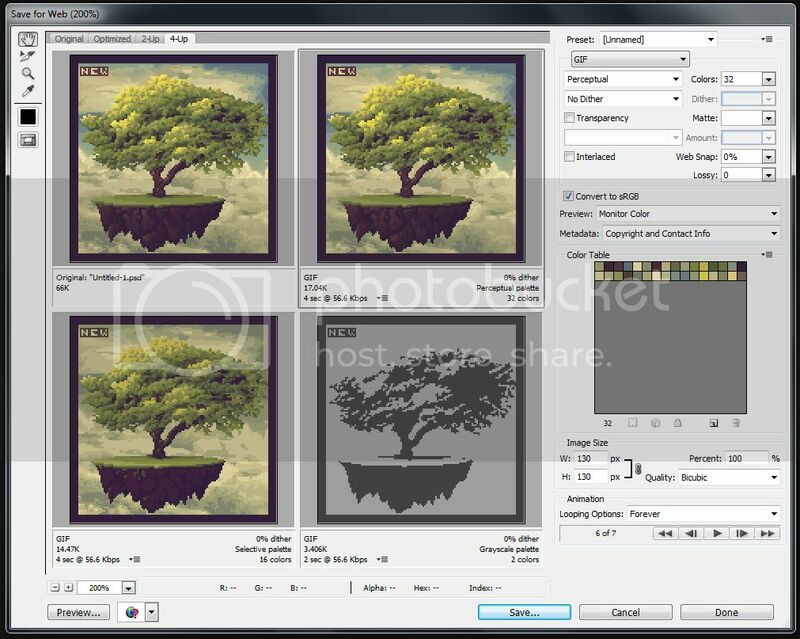 You right-click to select colors, right-click and drag to grab pieces of the image, and finally, it supports saving in low and high color formats, so you can tweak your colors/palette as you work. Also, I don't know if you were really going for 8bit like the NES quality, or if you really meant 16bit like the SNES quality. Either way, your work looks like 16bit more than anything, which means low color count is important. You start adding too many colors, and it will just look like old-school Windows 95/98 graphics. I wouldn't suggest going over 64 colors no matter what if you can avoid it. Regardless, from the poor quality of your update image, it looks like it's coming well -- it's just really hard to tell anything about your technique in a JPEG. You should at least just get Graphics Gale to save in various pixel art formats. I think my issue is file-sharing. ive tried a few things and nothing is keeping the file at the quality my computer has. I'm giving imgur a try with my latest .gif file of the progress I've made. -colors are in the high 40's, and they should be going down from there. -I'll go get Graphics Gale and see what it can do for me, but Photoshop isn't actually compressing the .gif and .png files I've made. That's a file-sharing issue. -I'm still working on the leaves and grass. I'm not sure what work to do on the dirt and sky, if there are still some problems with that. -I might do a pallate change, even though i like the colors being used. Alrighty. This should be the correct quality, unless I'm not anticipating something. The "OLD" tag shows everything from the previous updates. The "NEW" tag is everything I've added since the last post. -I like the reshaded grass, but I'm no longer sure about texture. I don't think I liked it too much in the first place anyway. -I had Photoshop auto-lock me down to 2, 4, 8, 16, 32, and 64 colors for some testing. 64 colors made no change because I'm using less colors. 32 colors didn't make too much of a difference while getting rid of a few colors. I might aim to get rid of some of those colors. 16 colors changed a lot, but looked very interesting, so I might consider dropping lots of colors. 2 colors in gray scale gave an interesting silhouette. Pictures below. 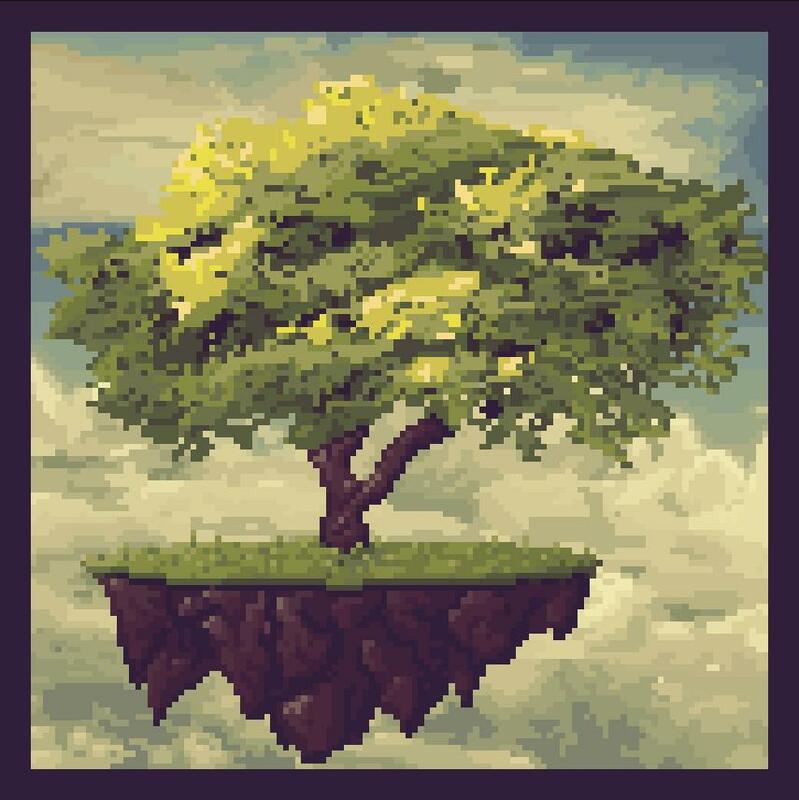 -The clouds behind the tree look very flat all of a sudden, so I want to re texture them in a similar fashion to the rest of the background. -Thank you guys a lot for helping me with the leaves. They look bunches better. I still want to get some forms in there that look more like leaves than strands of hay. Towards the bottom and (our) right side, I sort of lost the inspiration and did random blotches again, so I've got that to fix. -I thought about adding grass hanging down the rocks, but with a small amount of space, I worried it might be more cluttering than anything. -I'm posting this in a 1:1 ratio, but I've been viewing it as a 1:3 or 1:4 ratio. The final image will be a blown up version. Hi. I made a very rough edit of your 16 color version. 16 is plenty and more than enough for your piece. I tried to place some light on the leaves... but i'm not very good at it, just to give you an idea. Also played a bit with your palette. Still a lot of colors to clean up.